The instructions were to memorise the "items". 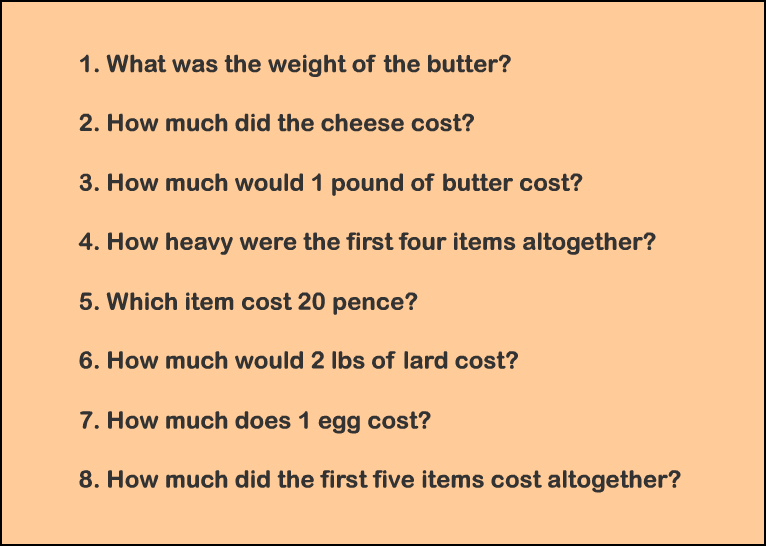 This can be interpreted by some students as memorising only the articles - but not the weights or prices. Thanks Jaden. 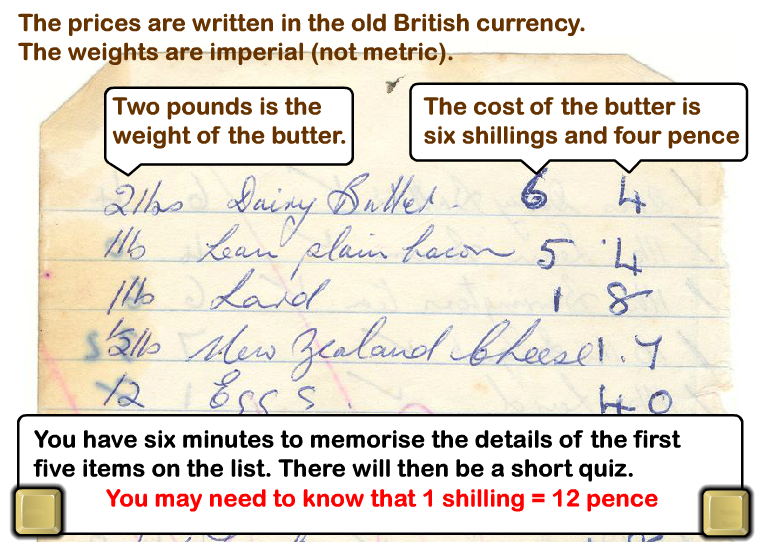 The instruction has been modified and now asks students to 'memorise the details of the first five items on the list'. Hope that helps. Thanks for your comments. I 'inflicted' the old system on my students and made them pay for items – I made (photocopied and laminated and then cut out) a whole load of old coins. I wanted my students to realise how easy they (and me) have it now. I'm old enough to have been given the old pennies when they were instantly worthless, but never had to use the old coins. My mum had to explain it all to me, and I'm still a bit confused! But the kids loved it – and even a bit of history thrown in with the fact that the sovereign was made of gold but was 'requested' by the government to pay for the war effort, meaning we never had coins made of gold again. Fantastic. Like I said, I’m trying to get starters that involve some SMSC. In case you haven't heard it enough, your site is amazing – my daughter loved your Roman numerals jigsaw puzzle, which is another starter I've used and will continue to do so. This starter has scored a mean of 2.7 out of 5 based on 113 votes. Here is the URL which will take them to another activity involving money.